Visualization of a neutron star merger seen in gravity and matter. Photo/Karan Jani-Georgia Tech. A collaboration that began 16 years ago between computer scientists at the USC Information Sciences Institute (ISI) and members of the Laser Interferometer Gravitational-Wave Observatory (LIGO) and Virgo projects is opening up a new window onto the nature of the universe. Pegasus, a specialized computer program developed by a team of ISI computer scientists led by distributed computing expert Ewa Deelman in collaboration with HTCondor, played an important role in a new astronomy discovery announced by LIGO, Oct. 16 in Washington, D.C.
For the first time, scientists have directly detected gravitational waves — ripples in space-time — in addition to light produced by colliding neutron stars. 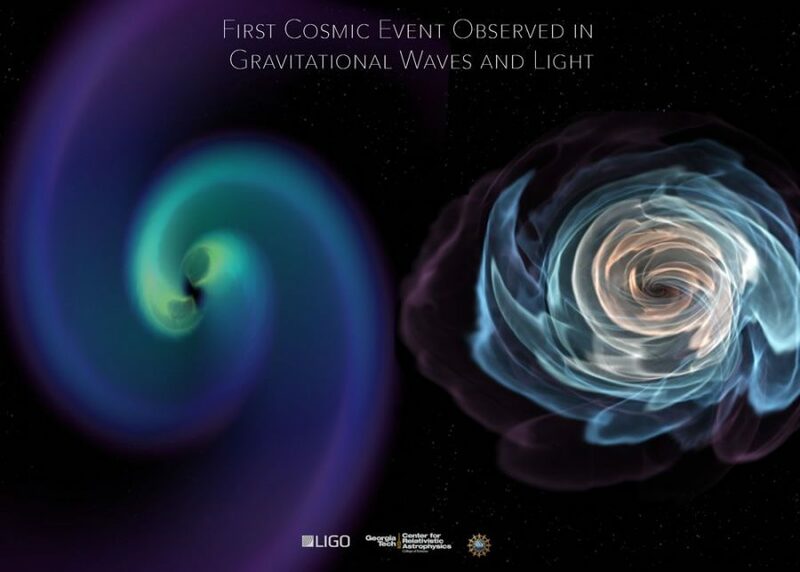 Detected by two identical LIGO detectors on Aug. 17, this marks the first time that a cosmic event has been viewed in both gravitational waves and light. The software developed at ISI allowed the LIGO scientists to confirm the signal’s significance by conducting rigorous offline analyses of massive amounts of data. As part of this latest discovery, in August 2017 Pegasus managed almost 4,000 workflows with more than nine million tasks. Other benefits of Pegasus include automatic recovery after job failures, the ability to automatically manage data flow, and a dashboard to track progress and identify the sources of job failures. This is not the first time that Pegasus, a workflow management tool initially designed for astronomers, has helped to propel a new scientific discovery. In 2016, LIGO scientists first discovered gravitational waves, confirming Einstein’s Theory of Relativity. The breakthrough, which received the 2017 Nobel Prize for physics, was made possible in part by Pegasus. “It is extremely exciting to see years of computer science research and software development have impact on cutting- edge science,” said Deelman.